Over 100 research studies have proved the value of increased Employee Engagement. The results are fewer employee relations issues, a more stable workforce, and increased profits. As the Gallup numbers indicate, enhancing Employee Engagement can produce benefits that accrue throughout your organization. Increases in labor productivity alone easily justify investments in Employee Engagement. The returns are significant relative to the very affordable cost of improving engagement. 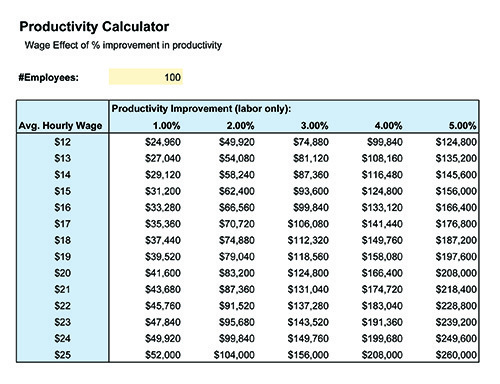 As an example, in a company with 100 employees and an average wage of $12/hour, a 1% improvement in productivity is worth $24,960 each year in labor cost. It’s easy to justify the investment. The cost to the company to get started with GEA’s Employee Engagement Survey would be only $1700 against a nearly $25,000 ROI. Survey results from the Gallup organization indicate that engaged employees are 18% more productive, but there is a significant return on even a 1% increase in productivity. The chart below shows annual return based only on average labor cost (i.e. the need for additional employees), exclusive of other productivity gains. It’s easy to see that the Employee Engagement Survey, coupled with a proactive response, will quickly produce bottom line results. 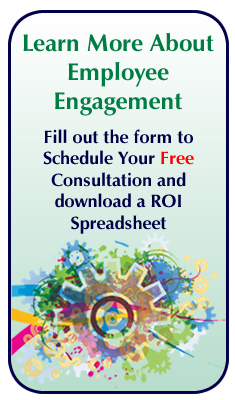 Fill out the form in the sidebar on this page to download an .xls spreadsheet of the calculator and schedule your FREE Employee Engagement consultation. Pre-survey conference call to tailor the process to meet your organization’s needs. A Survey Results Report – referenced to GEA’s database of similar businesses and segmented by supervisor. A post-survey meeting or conference call to discuss your results and suggest practical steps for improvement. 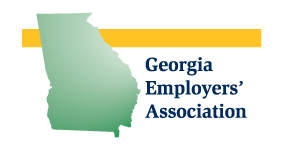 Georgia Employers’ Association has provided valuable assistance to Georgia businesses since 1981. Over the years, we have developed an extensive database of survey results from Georgia companies that will provide you with a useful comparison to other businesses who have conducted the survey. GEA’s Employee Engagement Survey is based on the latest employee and organizational performance research, and provides an in depth analysis of the significant factors that affect engagement. Results are segmented by supervisor, to assist in identification of customized training or coaching that may be beneficial. GEA’s Employee Engagement Survey has been endorsed by Constangy, Brooks, Smith and Prophete, LLP, one of the nation’s leading employment and labor law firms.  GEA’s new reduced fee is only $17/employee for 75 employees or more. Surveys can be conducted in combination for multiple smaller employers, with results segmented for each participant company.